We offer everything your turf needs, from amenity products like grass seed, fertiliser and fungicides, to landscaping equipment and irrigation supplies. 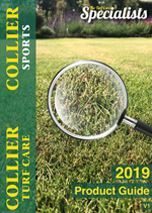 We are trusted online turf suppliers who offer a comprehensive range of products from many other key manufacturers in the industry, including ICL, Barclay Crop Protection, Vitax Amenity and Barenbrug. Get free delivery on orders over £250 ex. VAT, alternatively you can arrange a free collection on any of our products.